New York City marches on May Day | Fight Back! 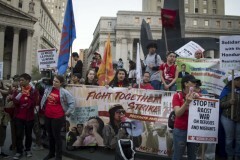 New York, NY – Several hundred people gathered in Union Square Park to rally and march in celebration of International Workers Day, May 1. The event was pulled together by over 60 organizations, under the leadership of the organizations in the International League of Peoples’ Struggle. The celebration began on the north side of Union Square Park, which was a change from the last ten decades when May Day was celebrated on the south side. This move was an initial deterrent by the NYC Parks and Recreation Department to stop May Day. However, the organizers were ready to rally regardless of attempts of political repression. The march began at 5 p.m. and headed to Foley Square, the Federal Plaza in New York. While the marchers kept their spirits up, the NYPD tried several times to stop, deter and break up the march. The main occurrence was when they attempted to break up the front of the march near the corner of Washington Square Park - where Mayor De Blasio was holding his event. However, the organizers out-maneuvered the cops and were able to get their march back together and end in Foley Square! The day ended with small speak-outs, chants and a recommitment to the movement.